First of all, if you haven’t entered our DietBet, you still can–it starts today! Click here for more info and to join up! One of you is getting $250 bonus cash and everyone gets a free workout plan. The odds are great right now, so come join us! So apparently I’m, like, the only person in the world who (until a few months ago) had never heard of Neiman Marcus Dip. I’m not sure how this happened…I don’t totally live under a rock (even if Pinterest kind of gives me hives and almost always makes me feel wildly inadequate.) So in my PNMD (Pre-Neiman Marcus Dip) life, I was blissfully unaware that such a thing existed. And then I was at a meeting where I was hungry and tired and the person holding the meeting brought snacks, including this dip (note to all people holding all kinds of meetings: snacks never make things worse). And I couldn’t stop eating it. You know that conundrum when you have chips and you have dip and they never quite even out, so you run out of chips before you run out of dip, so you get more chips, then you run out of dip, so you get more dip, and you keep going around and around in the Devil’s Cycle of ChipDip? Yeah, that happened. And it was so delicious that I didn’t even regret it. So I asked my friend for the recipe and that’s when I learned that this is a thing. But then she was kind enough to send me her favorite version of the recipe, because there are recipes o’plenty out there. But…funny story. 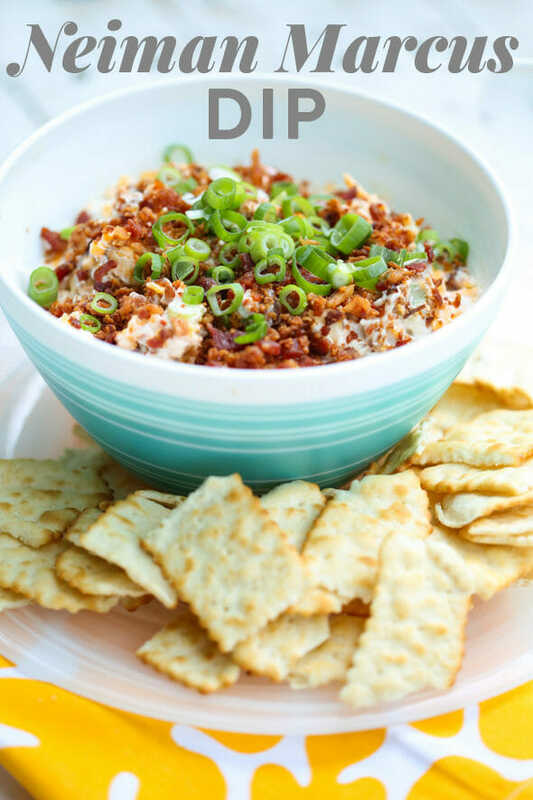 Actually–let’s back up to that time we bought my son a shirt that said something to the effect of, “‘That’s too much bacon!’ Said no one ever.” Well, when she sent me this recipe, I swear she told me to use an 8-ounce jar of bacon pieces. 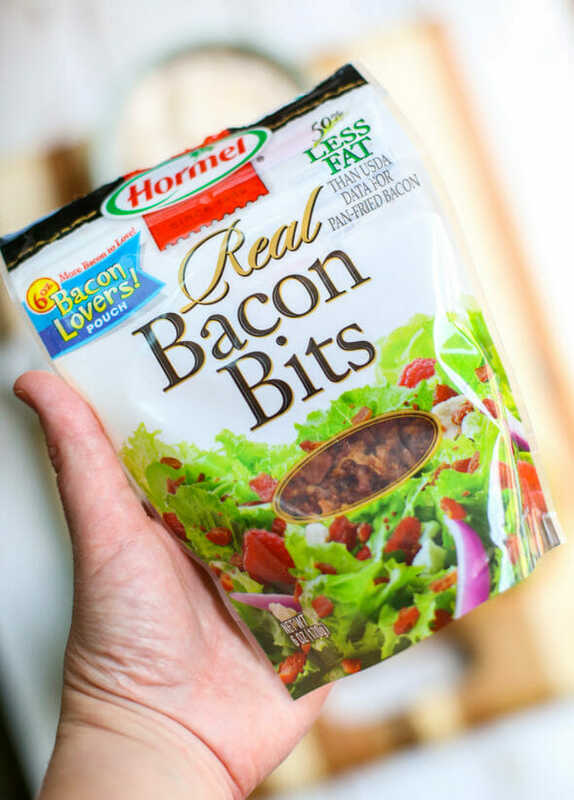 Turns out there are no 8-ounce jars of real bacon pieces, but there are 6-ounce bags of real bacon pieces. And I’ll just tell you right now, it’s a lot of bacon. Thinking, “Hey, this is kind of a lot of bacon, and it’s not even 8 ounces,” the first time I made this, I opted to live on the edge and just be 2 ounces shy of the recommended amount of bacon. Well. I discovered that while I thought it wasn’t possible, there is such a thing as too much bacon and that whole 8-ounce jar was supposed to be a 3-ounce jar and if you’re ever looking to drastically increase your sodium and processed meat intake, using this whole bag would be a great way to do that. So don’t be like me. Use the 3 ounces of bacon. You’re only going to need a few ingredients here–that’s part of the beauty. 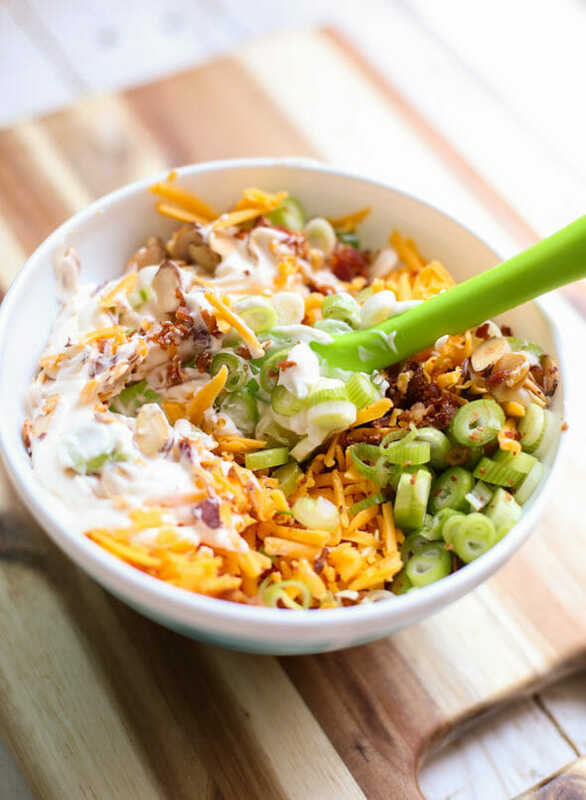 Some mayonnaise (light is fine), 3 ounces real bacon pieces (not those gross bacon bits that are not actually bacon), green onions, shredded sharp or medium cheddar cheese, and a handful of sliced, toasted almonds. and stir well to combine. 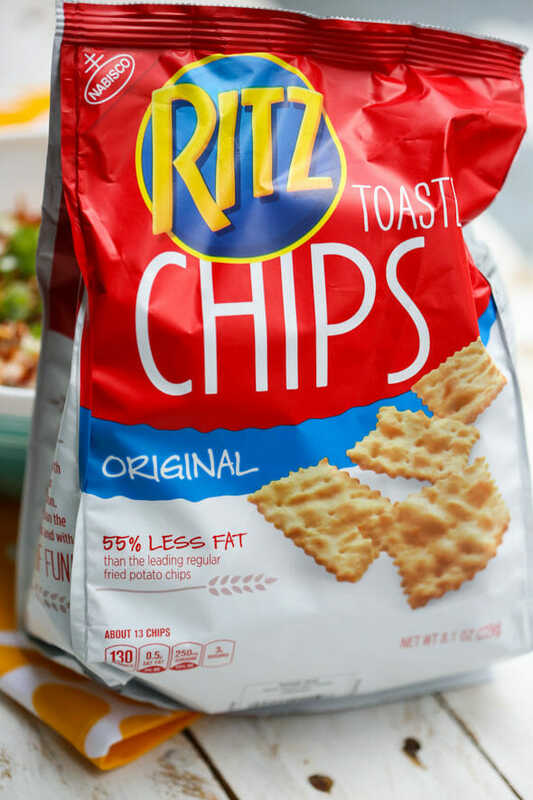 Refrigerate for at least an hour before serving with chips, crackers, veggies, or, if you have very excellent taste, these Ritz Chips. You won’t be sorry. Try to stop. You won’t be able to. 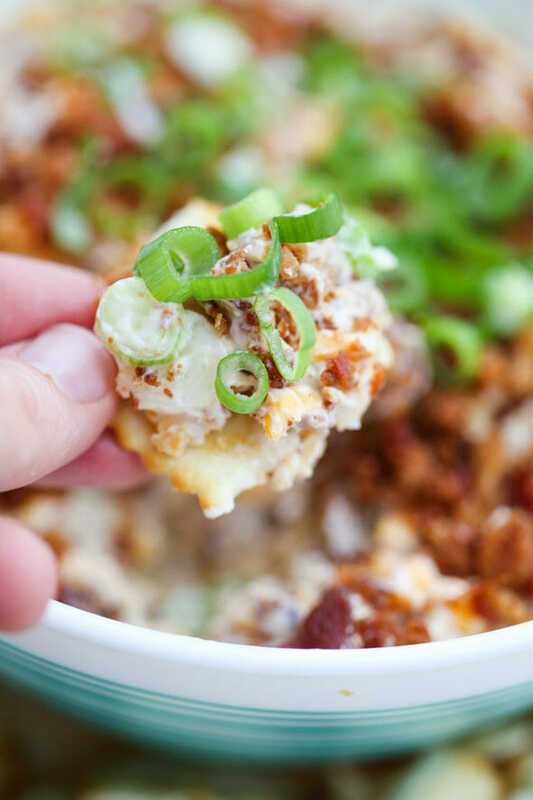 A handful of ingredients and about 10 minutes later, you have the most addictive dip on the planet! Okay, I’ve never heard of this either. But I love me a good dip, so sign me up. Also, I’m always amazed at how pretty you guys can make things look. Mad picture skillz. 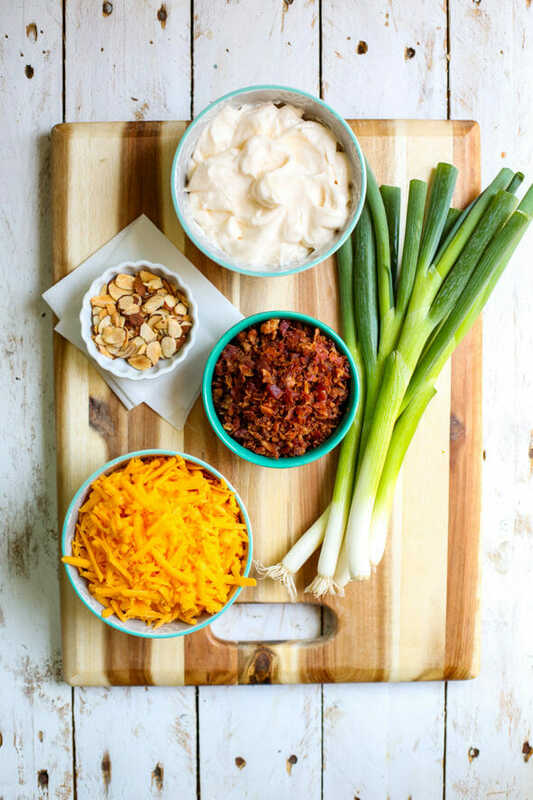 Like, I’m swooning over the pic of all the ingredients in little lined up sections. What does this say about me that I swoon over mayo, shredded cheese, onion, and bacon pictures? I digress. And I wish I had some of this right now. I’ve never heard of it either! And I also love how you arranged the ingredients in the bowl before stirring them together!! We call this Catch a Man Dip, or Cheese Ring (chill and form into a ring). Our recipe has double the cheese though! What really sends it over the top is serving it with a little strawberry preserves. Sounds weird, I know, but trust me, the sweet and savory is fabulous! Hahaha!!! Basically, we’ll always need DietBet because we’ll always have this! ? This is my favorite dip. I’ve been making it for a few years now, but have to make two batches. One with bacon and one without, because my husband doesn’t like bacon! (How we manage to stay married, despite this obvious flaw to his character, is a miracle) The without bacon version is sort of like an onion dip, it’s still good-but not as good. I’ve never heard of this, but I love a good dip so count me in! Okay, this sounds amazing….except I really, really, really hate mayonnaise. (Don’t worry, I’m not a Miracle Whip person, either!) Is there enough other stuff to mask the mayo? Or might there be a suitable substitution? I would probably do sour cream or cream cheese (or a combination of the two). I don’t like mayo either, and you won’t even notice it in this recipe. There is so much other stuff, the mayo is really just a binding agent to hold it all together. Mayo and I are not good friends. I usually sub sour cream for it. Do you think that would work in this? Where do you fund the real bacon pieces? Ive checked Winco and Walmart with no success. Costco also sells it. Kirkland brand. I would try plain Greek yogurt mixed with the mayo to cut the calories. Can it be made without almonds due to a tree but allergy?? And ritz crackers with it are a must. So great together. Thanks for another awesome recipe. Love you girls! 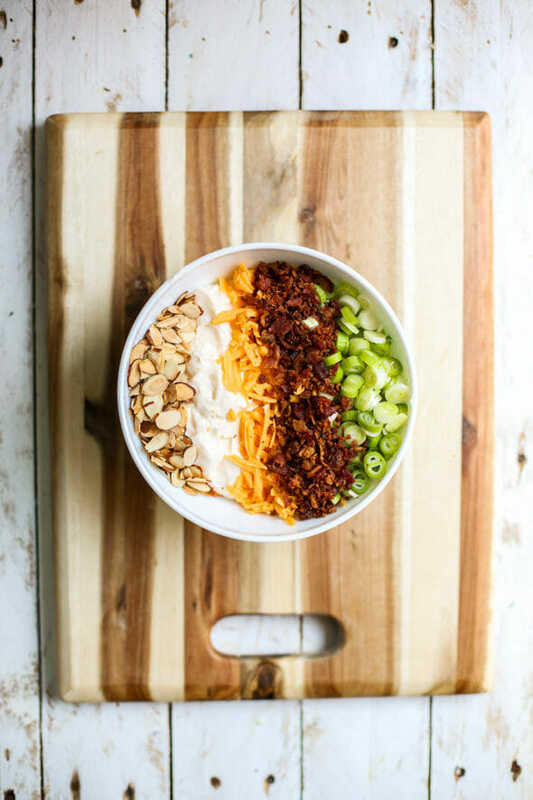 Recipe looks delicious but I’m not a fan almonds could you use toasted pecans or cashews in this instead! Perfect for Super Bowl tomorrow!